KOKOMO, Ind. — People called Jennifer Santos crazy when she quit the job she'd held for nearly 14 years, to enroll in college. Commencement 2014. See more pictures on Flickr. On Tuesday, May 13, they called her a graduate. She received her bachelor's degree in public administration from Indiana University Kokomo, and now hopes to begin a career with the federal government. "I wanted to be able to do a job that not just anybody could walk in and do," Santos, from Kokomo, said. "It was a big leap of faith to leave my job. That's how much I wanted to get an education. I am glad I took that risk." Nearly 600 graduates celebrated their accomplishments during two ceremonies, moved inside to Havens Auditorium due to inclement weather. There was a festive atmosphere despite the overcast skies and intermittent thundershowers. Many graduates marked the occasion with specially decorated mortarboards, including one with a bright red crystal IU pitchfork, surrounded by brilliant white crystals. Others had names, simple designs, and, one nursing student proudly proclaimed "RN" on her mortarboard. Alaynah Weisend wore an honors medallion with her cap and gown, signifying completion of the honors program, along with her nursing degree. The honors program required her to do research projects above and beyond what the rest of her classmates did in several classes, which she admits was stressful at times, but she wouldn't have it any other way. "I like to challenge myself," she said. "This day was a long time coming." She started at another school, in another major, before deciding to come back to her original dream of being a nurse. Now she wants to work in an emergency room, before returning to school to become a nurse practitioner. "I have a passion for helping people, and being with them in their vulnerable moments," Weisend, from Peru, said. 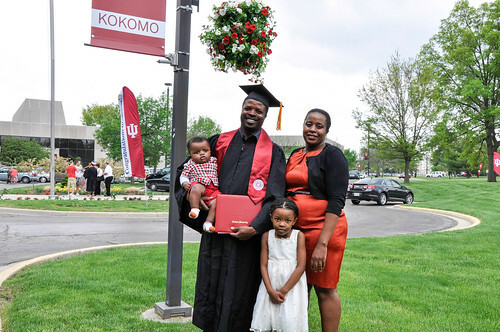 "I decided to go with my dreams, and study at IU Kokomo. I'm super excited today, and I feel accomplished. The faculty here really care about us, and they gave me the tools to be a great nurse." Weisend was thrilled to have her parents and her four-year-old son there to see her earn her degree, and said she could not have done it without their support. "I'm definitely blessed with amazing parents, who did all they could to help me succeed," she said. Her classmate Paula Melcher said the best part about the nursing program was the friends she made while earning her degree, and she will miss all of them after Commencement. "The people in my cohort have all been really close," she said. "The friendships I've made here are priceless. The IU Kokomo program is the best one available, and I feel prepared for my future." She plans to continue working at St. Joseph Hospital in Kokomo, and eventually return to school to become a nurse practitioner. Melcher, who is from Converse, is proud to set a good example for her two sons, ages 6 and 8. "They can see I worked hard, and they will see all the rewards from that hard work," she said. "They will see that being educated is important." Tyler Keck returned from student teaching in New Zealand just before Commencement, and looks forward to traveling to Great Britain with the Innovation Symposium later this week. He hopes his international experiences lead him to a teaching job with one of Kokomo's International Baccalaureate Schools. Keck, a Kokomo resident, was excited to graduate. "It's just the culmination of the last four years, and a jumping off point for the future," he said. He was especially proud to have his mother, a teacher, in the audience to see him graduate. "It feels worth it now, all the hard work. It feels good to look back and see all the people who helped me, all the great people, family and friends, who are teachers, and to join them in that profession," he said. Lauretta Aleshire, Kokomo, can't wait to begin her teaching career, after completing her degree in secondary education and special education. She already has a permanent substitute job at Kokomo High School, where she was a student teacher, and she hopes it leads to greater things. "I am excited to begin my career, and to work and provide for my family," she said. "I love working with my students, and watching them learn and grow. I am grateful for so many good professors who worked with me and kept me on track, and were always willing to answer questions and help me." Nick Davis left a factory job to earn a degree in health sciences, and now hopes to work in medical sales. He remembered times he was ready to go back to full time work instead of school, but now is glad he persevered. "Today means a lot to me," he said. "Several years of hard work and dedication have finally paid off. There have been a few times I wanted to just give up and try to find a job. I am glad I didn't now." The Kokomo resident thought college gave him a better chance at a fulfilling job. "I wanted to get a career I was passionate about," he said, adding that he has started looking for that job. Evan O'Connor also has started his job search, after completing his degree in medical imaging technology, specializing in MRI. He plans to eventually earn a master's degree in health care administration, to further his career. He is especially proud of having earned a 4.0 grade point average for his last two semesters. "I feel like I worked hard, and it means a lot to me," said O'Connor, from Noblesville. "I can't wait to walk across that stage. Today feels absolutely great."